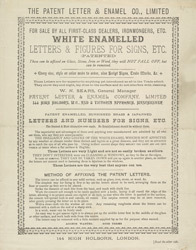 Reverse side of a bold and striking advertisement clearly been designed to display the range of typefaces and text fonts offered by the Patent Letter & Enamel Company. The main body text is done in a derivative of Times Roman, a thin-lettered 16th-century typeface with small serifs (small, curling elaborations on the end of letters). The larger text is done in a variety of faux-Old English or 'blackletter' styles. While the 19th century saw a boom in publishing and typesetting, it was at best a transitional era for actual typography, with most of the typefaces harking back to older and more established styles.